Since the days of James Watt, it has been known that condensing the exhaust steam at the end of a power stroke made a steam engine more efficient. When cold water was sprayed into steam it condenses into a liquid, and a partial vacuum is formed in the steam chamber. 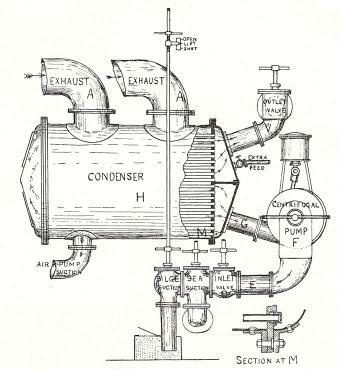 The early steam engines of the Royal Navy used this principle, the Jet Condenser, up to the late 1870s. 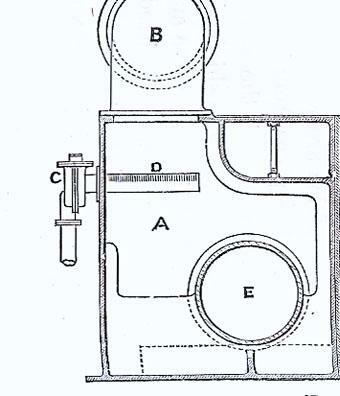 Sea water was sprayed from a nozzle (D) into a condensing chamber (A) which was connected to the exhaust of the steam pistons (B). The resulting hot water was either discharged overboard or pumped back into the boiler to replenish water evaporated as steam. Sea water contains about 3% of dissolved solids – salts. These dissolved solids are left behind in the boiler when steam is boiled off, so over a period of time, replacing the evaporated pure water with sea water increased the amount of solids, and the density of the water increases. When the concentration of solids becomes too great, the solids are deposited on the inside of the boiler as scale, which then forms an insulating barrier between the fire and the water. The formation of scale depends on the temperature of the water, which is dependent on the pressure in the boiler and also the density of the water (determined by the concentration of solids). A high pressure in the boiler means that the water and steam temperatures are also high, so the risk of scale forming is also high. The early steam plants ran at steam pressures of about 25 pounds on a square inch. To regulate the density of the boiler water, a proportion of the boiler water was blown overboard when the density reached one and a half times that of sea water (referred to as 15 degrees). To keep the density at 15 degrees twice the amount of water had to be blown overboard as would be evaporated as steam, and 24% of the heat generated by the coal was wasted. It was found, however, that at these pressures (about 25 pounds on a square inch), the density could be increased to about 30 degrees (three time the density of sea water) without harmful deposits forming on the inside of the boiler. 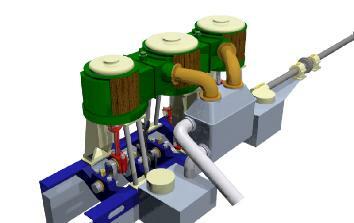 Only about 7% of the heat energy was now wasted when boiler water was blown overboard and replaced by sea water. To get greater power, however, requires boilers that operate at higher pressures, and this could not be achieved if the boilers used sea water. As the pressure inside a boiler increases, so too does the boiling point of the water. When sea water is raised to a temperature of 135 degrees C (280 degrees Fahr. ), which corresponds to a pressure of 50 lbs absolute or 35 lbs above the atmosphere, the insoluble salts, principally sulphate of lime (Calcium Sulphate CaSO4), are precipitated and form a hard scale on the hot surfaces. Once deposited, it will not re-dissolve and wash off. For Jet Condensers working at lower pressures, the boiling point of water also increases with the density, hence the need to keep the density controlled to below 30 degrees. The solution was to separate the cooling water from the steam by circulating cold sea water through tubes passing through the condensing chamber. The steam condenses on the surface of these cold tubes. The hot condensed water is not contaminated by the salts in sea water, and the when pumped back into the boiler, the density in the boiler remains at that of pure, or nearly pure, water. With no dissolved solids in the boiler water, there is no need to blow water overboard, and higher temperatures and pressures were then possible without risk of encrustation. 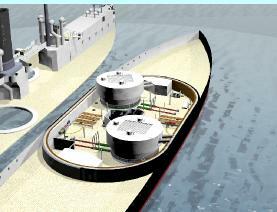 Since there is no need to blow off large quantities of boiler water to maintain densities, ships using surface condensers used 15% less fuel when compared to ships with jet condensers. 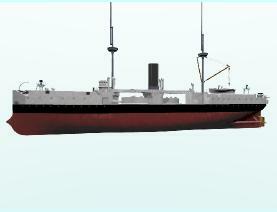 The engines in HMS Colossus were fitted with Surface Condensers. The high pressure cylinder received steam at the boiler pressure of 64 pounds on the square inch, and the exhaust was then fed into one of two low pressure cylinders to further exploit the expansion of the steam to produce work. Low pressure cylinders exhausted steam into surface condensers. Colossus’s surface condensers included a Jet condenser sprayer, so that if required as a result of action damage or an emergency, sea water could be used to condense steam. Either the risk of scaling could be accepted to maintain high boiler pressure in an emergency, or the boiler pressure could be reduced, which would result in a slight loss of maximum speed but reduced the amount of scaling.